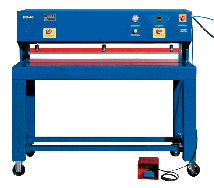 Horizontal industrial impulse heat sealers, are American made with heavy duty construction using welded steel. Pass through design. All horizontal heat sealers are pneumatically powered and feature low pressure safety close provides an airtight/watertight seal. Heat seal lengths up to 240 inches. Seal-able materials include polyethylene, laminated films, nylon. - Heat sealer are open back feed thru offset bag sealers. Material can be introduced from front-to-back or side-to-side.